The occasional creaks of my footsteps and odd howls from outside are replaced by an upbeat music signalling combat - but at first you feel sure that there are no enemies to be seen. It is at that point that something strange approaches the window and smashes its way inside. You’ve barely got used to moving around, but now you have to press Enter, select Fight and try to see if you can manage to defeat this beast. Pressing Space puts you in a fighting stance, and the four arrow keys give you different attacks. Of course, this isn’t my first playthrough, and there are a few ways here that the game tries to teach you to avoid combat encounters. The 3D objects obviously draw the eye, and suggest interactivity. When you first walk around the room, there is the small stool nearby which you’ll notice you can push around as you move into it. 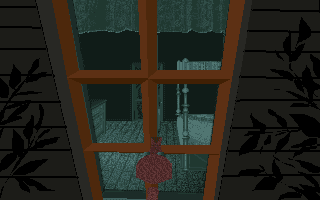 Upon replaying this section, you might then notice in the interaction menu a “Push” command, and discover that if you push the wardrobe it can be used to block the window, while the large chest can be moved across the trap-door for the same effect. Problem solved! 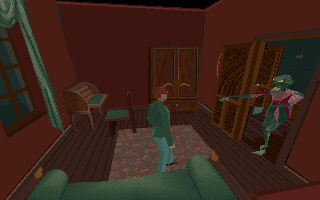 Now free from rude interruptions from ghoulish beings, I can begin to explore this room. There’s plenty to find here, so it’s well worth having a good look around. 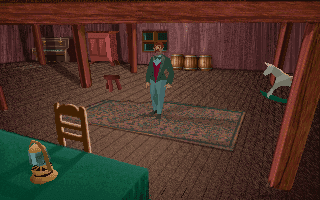 The first thing you might notice is that lovely Oil Lamp happily sitting on the table in the foreground of the opening screen, surely that must be useful. After all, this is Alone in the DARK, so a method of creating light is welcome. Next, that wardrobe contains what it calls an “Indian Covering”, not entirely sure what that means, but it looks like a piece of cloth or a nice rug or similar. The large chest contains a rifle, the image itself looking like a shotgun to me, but what do I know? It only seems to have four bullets, so I’ll have to save that for a special occasion. 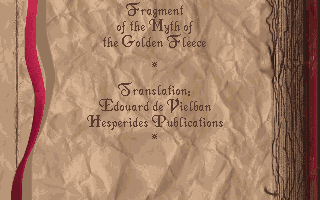 The bookshelves only contain one book that catches the eye, an excerpt from the Myth of the Golden Fleece. 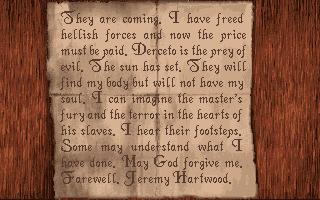 This book gives us a little hint of what might be coming up in the game, as Perseus tells his friends to shine up their shields like mirrors to blind Medusa, as well as a general hint that some monsters can’t be faced directly, but rather must be dealt with using tricks and puzzles. As an aside, the voice acting varies depending on the book or note that you’re reading, which is a nice touch and impressive for the time. The last thing to search is the piano in the corner. It looks like a fairly ordinary piano to my untrained eye, and yet you may recall that our employer noted that this antique may contain secret drawers and suchlike, so warrants a thorough search. Lo and behold, when I search the end of the piano a secret letter is found. This letter turns out to be the suicide note from Jeremy Hartwood, the deceased owner of this very house. He is concerned for his soul, about “The Master” and felt the only way to stop what was going on was to end his life. It seems that we should be similarly concerned, and try to stop this “Master” as soon as possible! Onwards and downwards we must go, although no doubt many obstacles will now have been placed in our path. Down the stairs from the Attic is a small store room, containing an oil can (possibly for that lamp? ), and a bow, but we have no arrows. Nothing else of interest seems to be here amongst the shelves, so it’s time to proceed to the next room, a corridor with five other doors leading away from us. On our way here, we proceeded directly across the corridor to the far side, so your first idea might be to head forward exactly the way you came. 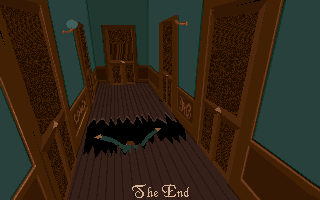 With little warning, aside perhaps from noticing the slightly odd graphical glitch on the floorboards, they will give way, letting you fall to your death (rather than falling to the room below, I suppose, although I am unsure that you could map this house with any sort of logical sense). Instead we choose from the two doors nearest to us, and I picked the left door first. This one is mostly empty, save for a large chest and some other furniture. The chest is locked, so I search about for the key and find it in a writing desk. The old cavalry sabre I find within looks sharp and menacing, just the thing to deal with these zombies and monsters. On the walls are two paintings, one of a man that doesn’t look familiar, and the other of a woman looking at a somewhat ghoulish reflection in a mirror. My chance to test it comes quickly, as I open the door to be greeted by yet another zombie. No way of avoiding this fight, I swing with my sabre and knock it back. Alas, during the fight the sabre broke in two, the blade dropping at my feet. Perhaps using such a weapon isn’t a great idea, so I reloaded an earlier save and made my way back to this point. There’s nowhere to go from here, so after dispatching the zombie I headed across to the next room on the opposite side of the corridor. After searching the room for anything interesting and finding nothing, yet another zombie decided to crash the party. Where do they keep these guys? Luckily Mr. Carnby has some swift kicking skills, and zombies aren’t much of a threat on their own. The next room throws a slightly different challenge at me, with beginning with a cramped room mostly filled with a bed and chest of drawers, as well as a large and obviously 3D window. Quite what the monsters crashing through the windows are supposed to be, is anyone’s guess. They look like giant miscoloured ducks with sharp teeth, and a mood to match. A swift kicking is the order of the day, and despite my difficulties with the controls and the awkward location I survive relatively unscathed. The chest of drawers is locked, and the only other thing here is a vase. I’m not sure how I figured out this little puzzle, there’s not really a hint for it I can see, perhaps I threw the vase by mistake, or at a monster. Either way, upon walking near it’s broken pieces, I came across a key. Using it with the only locked container left, yielded a pair of small mirrors. So at this point I have read a book about blinding a medusa, and I’ve seen a painting of a woman with a mirrored image, I think these mirrors might be very useful in the near future. Finally able to leave this corridor, beyond was a set of stairs down to the next floor. 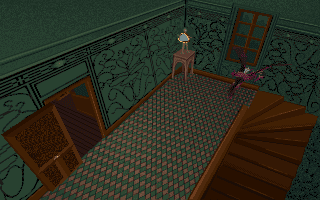 Unfortunately for me, the stairs were blocked on both sides by a strange demon that looked a bit like a skinny, purple gargoyle (they remind me in particular of the Bell Gargoyles in Dark Souls 1, if only very low detail and different coloured). Next to each gargoyle, on a small table, facing inwards to the centre of the room, are small statues. They both look like they could hold a small mirror, and since there have been a few hints about mirrors and their use earlier on, the natural thing is to carefully walk towards them (avoiding the gargoyles, who only strike you when you’re close enough), and place the mirrors in the statue. When the first is placed, the nearest gargoyle to it starts attacking randomly, reacting to the image perhaps. Upon placing the other, they both shriek in pain and collapse to the floor, disappearing in a cloud of what is possibly supposed to be smoke but looks a bit like purple bubbles. I think this is a good point to leave it for now, as I head downstairs, to be greeted by a pair of double doors closing in my face and the sound of evil ominous laughter. Addendum: (GOG.com version) I seem to be having a slight music-related bug, in which the combat music can get “stuck” as being the default. It happened during the fight with the two zombies and I tried restarting the game, turning on & off the music, moving back to other areas and reading books/notes (which stops the music while the voice-over is read). I could only stop it by going back to that fight, and waiting after killing the first zombie until the combat music stopped, then moving to the next room, the music starts again, and I wait until it stops before moving ahead. Very annoying, and not a problem I had previously, and I have no idea why it happens. If it happens again I might try using the CD-ROM version I have to continue. I chose to be Emily, just to be different. I've gotten near where you have, and haven't been enjoying it so far. I find the controls cumbersome, but expect to get used to it soon enough. It suffers to me from the "See where you got killed from, then reload and find a way to stop it happening before it happens" syndrome, which is not my favourite type of gameplay. I also haven't been scared yet - but it's still early - plenty of time for that to change. But after pointing out what I don't like :), I still plan to stick with it and will hopefully enjoy it more as I get further in. those controls really are from another era, but they're manageable once you're used to them. I don't remember if there's any story differences from playing as Emily, but hopefully you'll be able to let me know if there is! I got distracted by the music issues, and never bothered with that cos kicking that zombie down is very easy. It's a shame I couldn't move it to the next room, cos the fight with the bird-thing is a little more tricky in the cramped bedroom. 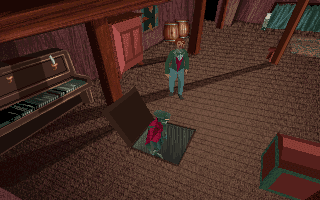 The logic of the random trapdoor element has always somewhat baffled me. 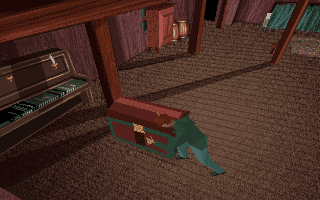 Since you're supposed to be in the attic, do they have really thick floors in which to store the zombie? Is there a room downstairs where they get stored and distributed somehow? It's small things like this that makes me appreciate when done correctly, e.g. when a hole in the floor is visible on the floor below. I don't know how well this is done in this game's case but I remember a lot of games of the era employing cartoon level logic, where a chasm in the floor above can simply be a one level affair.